Experience the lifetime of a horse in late 19th century England with this beloved, classic tale. Originally published in 1877, Black Beauty is the "autobiography" of a horse, chronicling a his life experience at the hands of his owners. Some are cruel, with no empathy, while others are kind and gentle. Each experience in Black Beauty's life teaches the reader a lesson about kindness, compassion, and respect. With illustrations by Cecil Aldin, this beautiful, vibrant clothbound hardcover is unabridged and makes a great addition to every child's library. 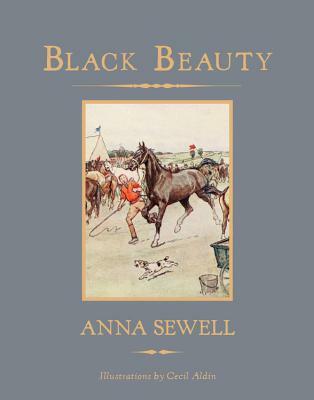 Anna Sewell (1820-1878) was an English writer, best known as the author of Black Beauty. At the age of fourteen, Sewell injured both her ankles and for the rest of her life was unable to stand without crutches or walk distances. To maintain mobility, she used horse-drawn carriages, contributing to her love of horses and her concern for their humane treatment. As her health declined, Sewell dictated Black Beauty to her mother, describing it as a novel to strengthen empathy toward horses. She died five months after its publication, living long enough to see its initial success as a children's classic.